Relationship between plants and filamentous microbes not only dates back millions of years, but modern plants have maintained this ancient mechanism to accommodate and respond to microbial invaders. 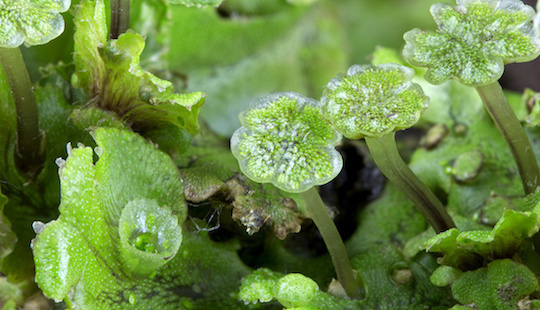 Published today in the journal Proceedings of the National Academy of Sciences, a new study shows that aggressive filamentous microbial (fungi-like) pathogens can invade liverworts and that some elements of the liverwort’s response are shared with distantly related plants. The first author of the paper, Dr Philip Carella, said the research showed that liverworts could be infected by the common and devastating microorganism Phytophthora: “We know a great deal about microbial infections of modern flowering plants, but until now we haven’t known how distantly related plant lineages dealt with an invasion by an aggressive microbe. To test this, we first wanted to see if Phytophthora could infect and complete its life cycle in a liverwort." Above image: ​A healthy Marchantia polymorpha liverwort (left) and one that has been infected by Phytophthora palmivora (right). 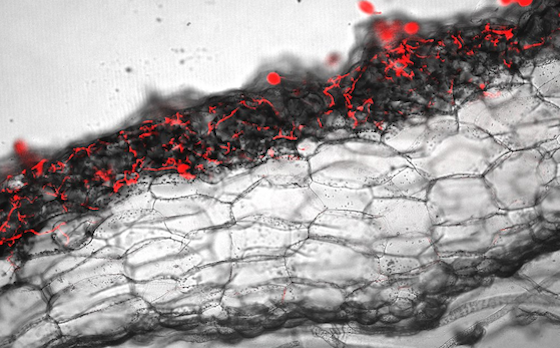 Above image: Microscopy image of a cross-section of a Marchantia polymorpha thallus showing the Phytophthora infection (red) in the upper photosynthetic layer of the liverwort plant. This research was funded by the Gatsby Charitable Foundation, the Royal Society, the BBSRC OpenPlant initiative and the Natural Environment Research Council.